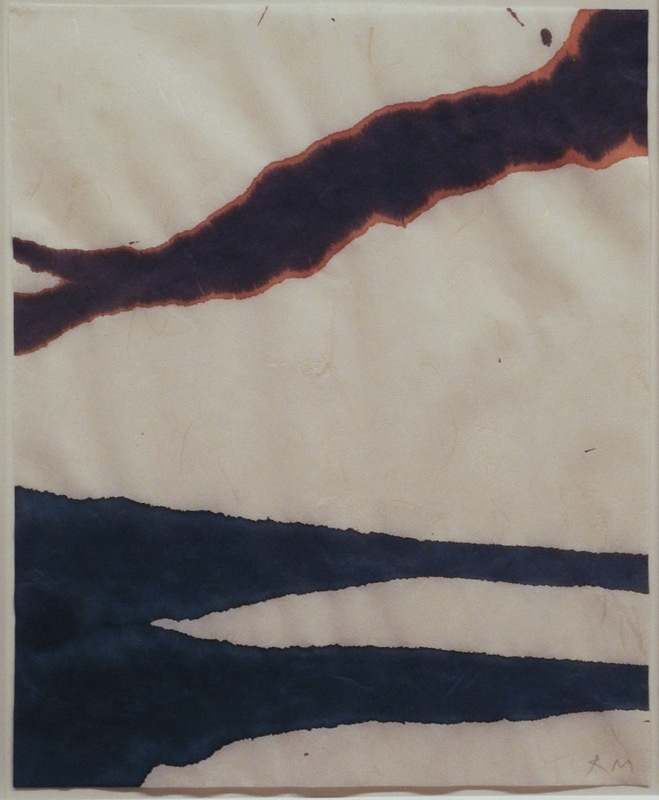 From Lyric Suite, 1965; ink on paper, 11 x 9 in. Freely brushed inks spread across paper with fresh abandon, a color haloing a darker one; circles that might have been accidents mark a path, add a loose geometry to fat flowing lines. Each picture would change before my eyes. The pictures literally continued to paint themselves as the ink spread in collaboration with the paper. A selection of this series, named after Alban Berg's Lyric Suite––a string quartet that Motherwell listened to in his studio––is currently on view at the Met. It's wonderful to see the variations of form, to get a sense of the immediacy of these works. 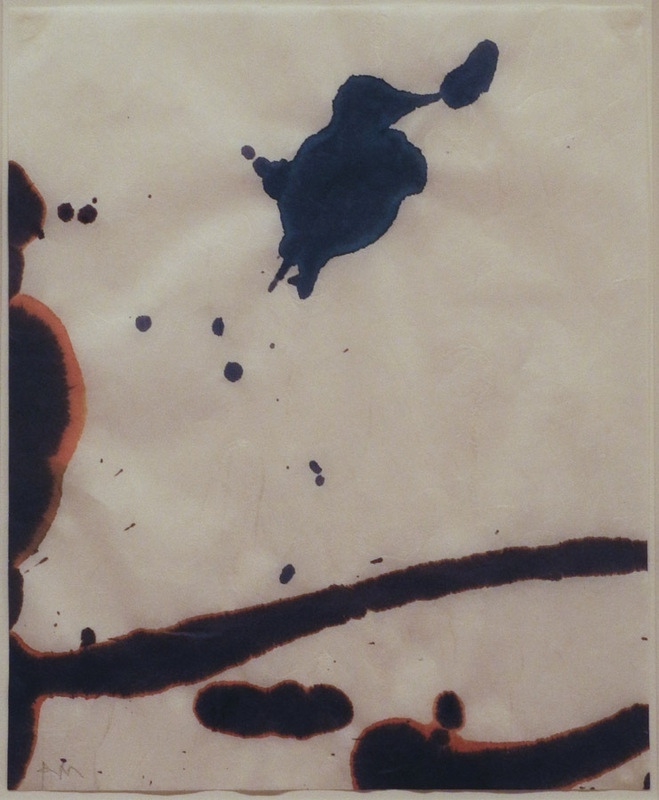 According to the Met: "Motherwell worked quickly and without conscious control, executing between ten and fifty drawings a session." I can readily imagine how thrilling it was to work in this manner, to wonder how a mark, a splash will transform into an image. There is so much life in these drawings; they don't stay still politely, but have a continuing pulsing energy. The drawings remind me of the looser forms of Asian calligraphy, which require many years of study in order to have the knowledge to use free brushwork. 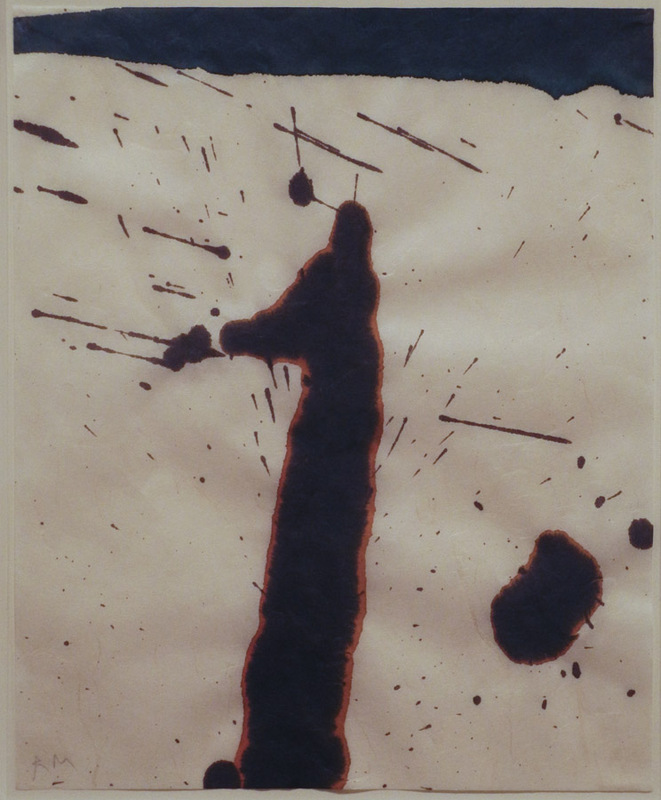 I had never thought much of Motherwell's work, since all I knew of it were the Elegies to the Spanish Republic, a series of works whose forms I found leaden and repetitive. Then last year I saw a couple of later paintings from the Open series, and realized that I didn't know the artist at all; I loved those works. The mezzotints below are from that series. They are minimal, but have an expansive space, beautifully brushed color, and inherent light. I see a similar sensibility in the Lyric Suite drawings and the Open series, with their forms inhabiting large spaces, floating within them. There is a great respect for the ground plane and its strong presence; the artist's entry into it is as collaboration, not dominance. 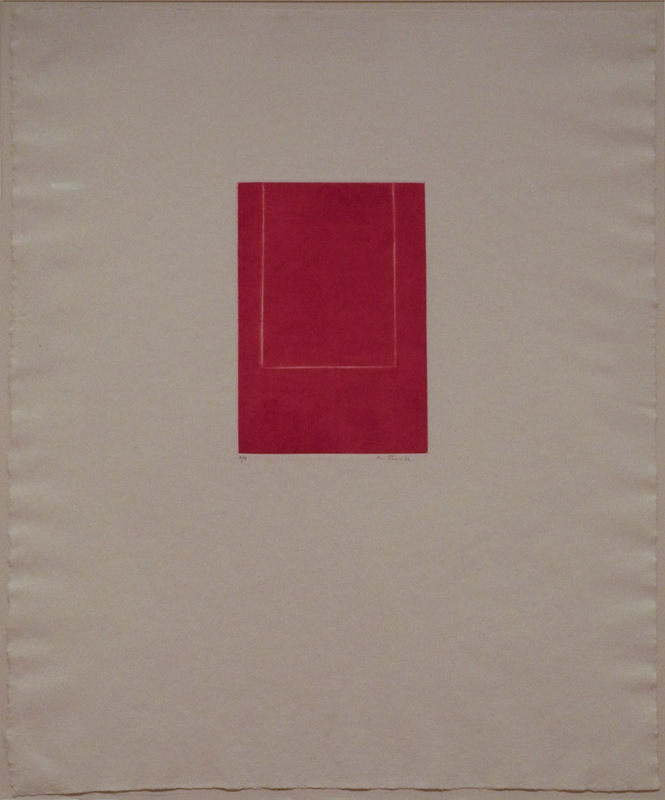 Mezzotint in Crimson, 1969; mezzotint, plate: 8 11/16 x 5 13/16, sheet: 25 1/8 x 19 15/16 in. 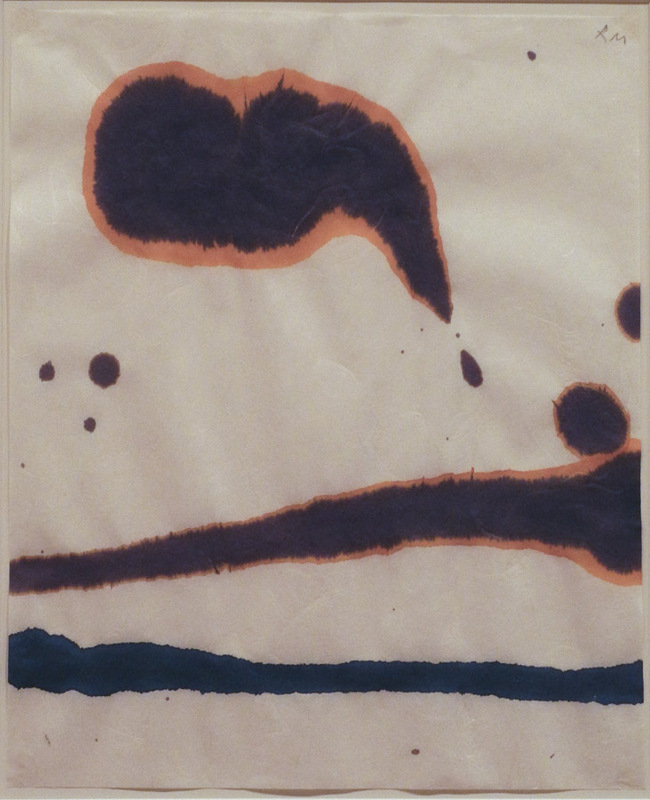 The exhibit included several other works in different mediums by Motherwell, including mezzotints using the form of his Open series. I have read a couple of different origin stories for this series, which he began in 1967. One is that it came from a chance arrangement of one small vertical canvas leaning against a larger one. Another, from MoMA, is that it was "responding to the impulse in European and American visual arts to regard painting as a window". But that goes against the general idea of the "integrity of the picture plane". 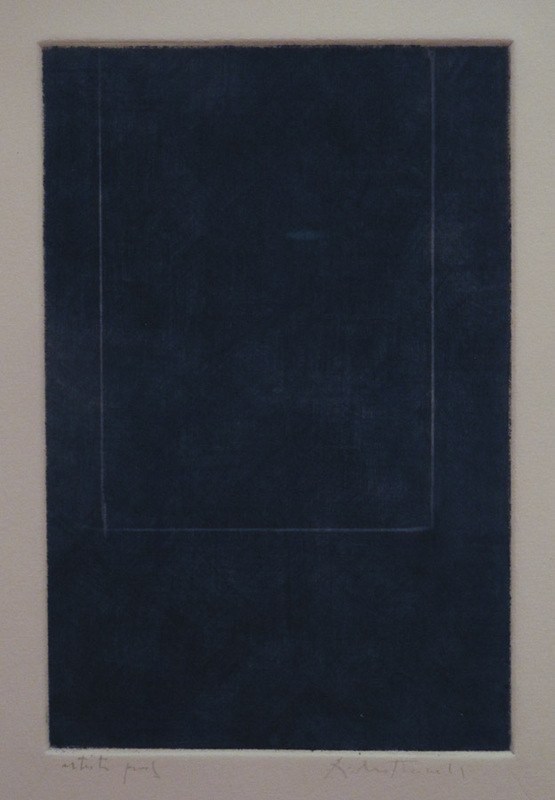 Mezzontint in Indigo detail, 1968; mezzotint, plate: 8 13/16 x 5 13/16 in..
To me the works are existential: the open rectangle a human structure, existing in boundless space. The intervention of geometry is delicate, unassertive, but insistently present; the field, though dark, is luminous. I find them very moving. 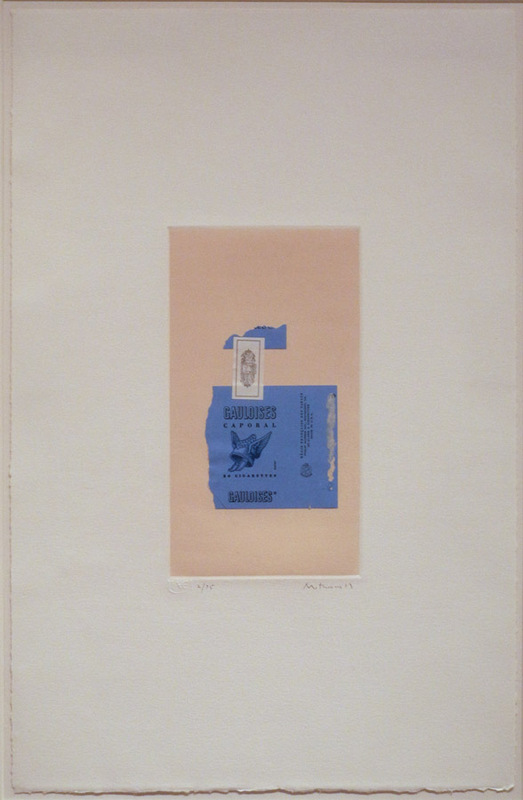 Gauloises Bleues, 1968; aquatint and collage, plate: 9 3/4 x 5 1/4, sheet: 22 x 14 5/16 in. 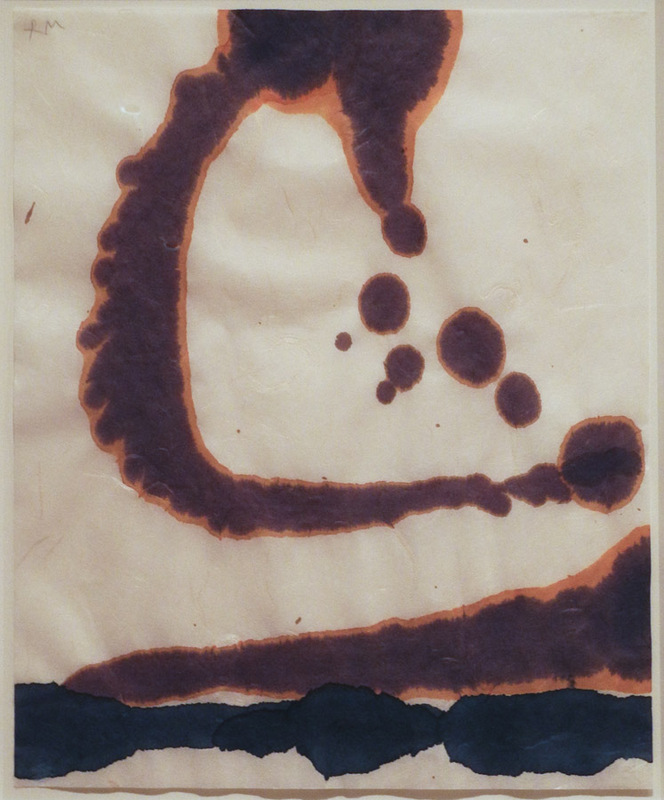 Motherwell was also a master of collage, and I have regretted missing recent shows of this work. This small piece shows a perfect balancing of large and small shapes, and color. There's a narrative to the work, too, since we realize that the sky blue wrapper is from a cigarette package. 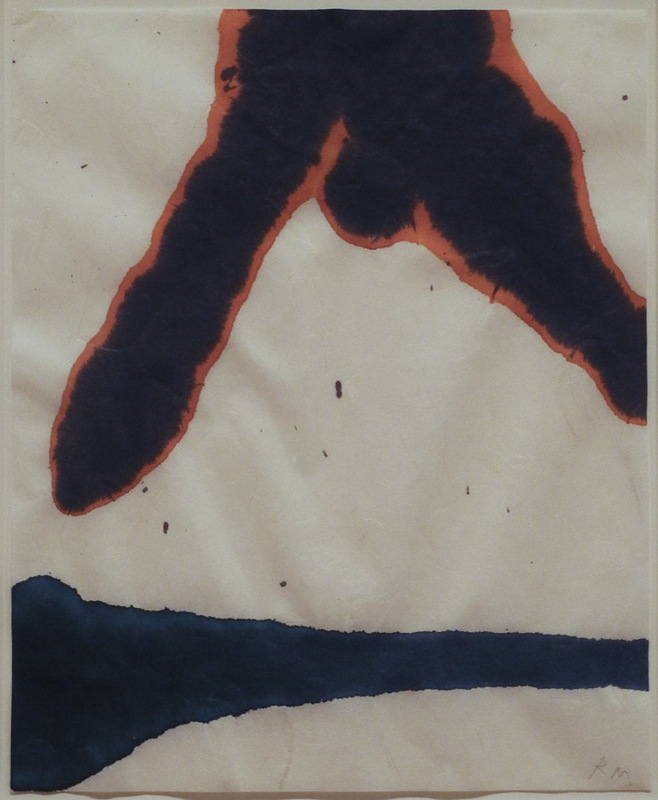 Untitled, 1973; pasted papers and lithograph on paper. 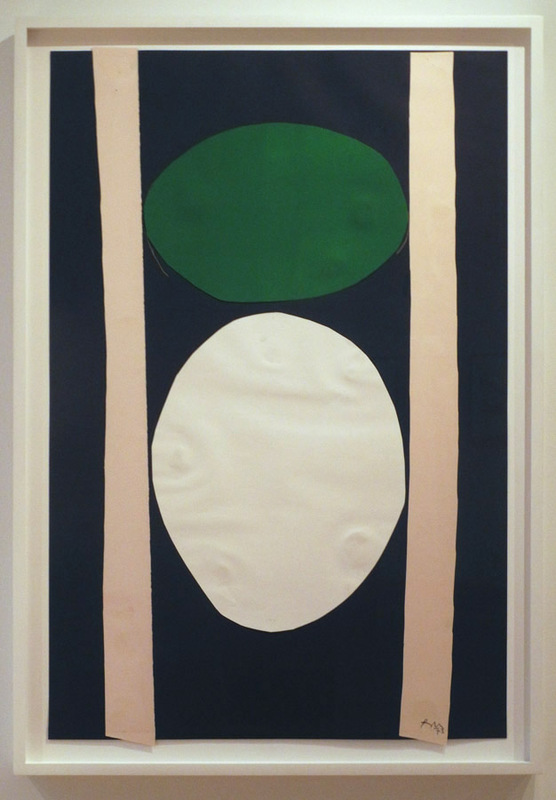 A later collage makes reference to Motherwell's Elegy series, as rounded forms are bound between vertical lines; protected? imprisoned? The two ovoids have more buoyancy than the black shapes of his Elegies; they feel human, even musical. Their colors––green and white––have hope within them, and the irregular pink bars have some warmth. It is such a pleasure to newly discover an artist I'd long dismissed; thanks to the Met for this nice little show, on the 100th anniversary of Motherwell's birth. Discovered Clyfford Still at the Albright-Knox this weekend. Sorry, JBS, I am not a fan of Clyfford Still's paintings; you would not have wanted me there. But I would have...I would have appreciated hearing your responses to the several large paintings, whatever those responses had been. My step-son-in-law was there with me...whizzing right by so many great works, saying "I just don't get it." You would certainly have been a step up from that! Oh well....it's all academic. There's no accounting for taste. The emperor does dress occasionally. VERY cool work and POST! I'm glad you enjoyed it, Sue.